To mark the Global Accessibility Awareness Day (GAAD), Apple CEO Tim Cook spoke about accessibility in an exclusive interview with James Rath, a young filmmaker who was born legally blind and caught Apple’s attention last year for creating a video about the impact Apple products have had on his life. 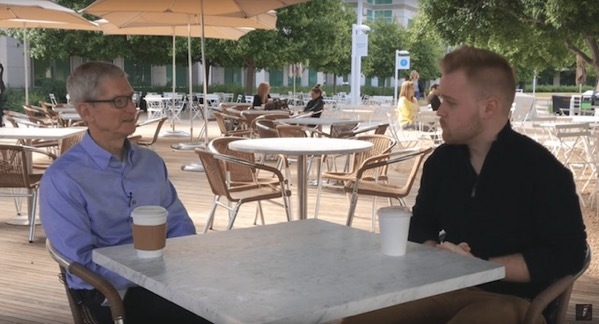 Cook talked about the importance of accessibility with Rath and two other YouTubers, Rikki Poynter and Tatiana Lee, in the courtyard at Apple’s Infinite Loop campus. Cook and Poynter, who is deaf, discussed closed captioning and how accessibility is a core value at Apple. Lee talked to Cook about the Apple Watch and its ability to track wheelchair use.